On April 22, the U.S. Environmental Protection Agency (EPA) announced the four winners of its second annual Campus RainWorks Challenge. The competition is a design challenge that engages university students in reinventing water infrastructure and developing innovative green infrastructure systems to reduce stormwater pollution and build resilience to climate change. The challenge fosters interdisciplinary collaboration among university students and faculty with the goal of increasing the use of green infrastructure on campuses across the nation. This year, EPA introduced two design categories. Under the master plan category, students focused on how green infrastructure could be integrated into a broad area of a school’s campus while the site design category was focused on a particular site on the team’s campus. Teams of undergraduate and graduate students, working with a faculty advisor, developed innovative green infrastructure designs in both categories, showing how managing stormwater at its source can benefit the campus community and the environment. The Water Environment Federation (WEF) is a cooperating organization for this program, and several WEF staff and volunteers participated as judges. The team’s design plan centers on a 27.3 ha (67.6 ac) subwatershed in the northeast corner of campus. To engage students with the journey of water, the three-phase plan would transform two detention facilities into campus amenities and daylight the flow of stormwater into above-ground pipes and vegetated bioswales. In addition to treating and retaining stormwater and improving groundwater recharge, the team’s plan would improve aesthetics and safety along a major road. 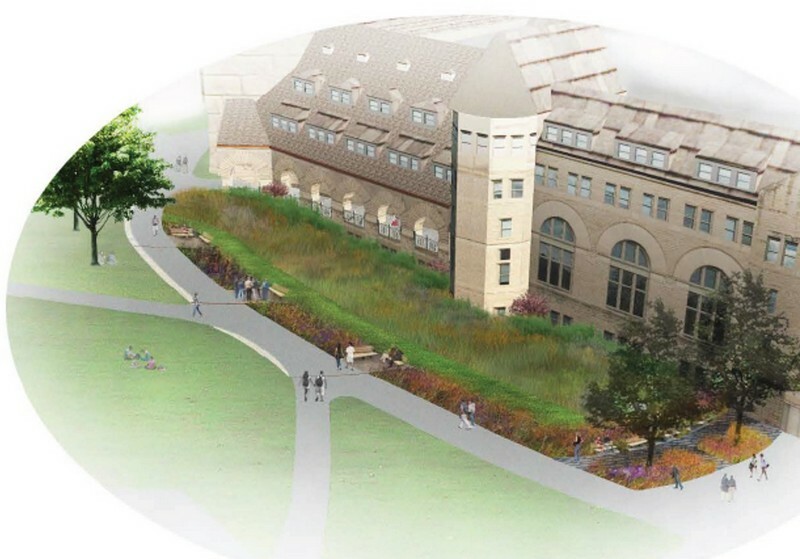 The team’s design plan calls for a stormwater pocket garden in a high traffic area in front of Hale Library. Consisting of disconnected downspouts, wet meadows, rain gardens, and stormwater runnels, the system is designed to retain 100% of runoff from a 1-year storm. The team’s plan also incorporates native prairie vegetation, allowing the site to support native songbirds and pollinators and reducing maintenance and irrigation needs. The team’s design plan centers on a 6 ha (15 ac) area in the center of campus currently dedicated largely to surface parking. 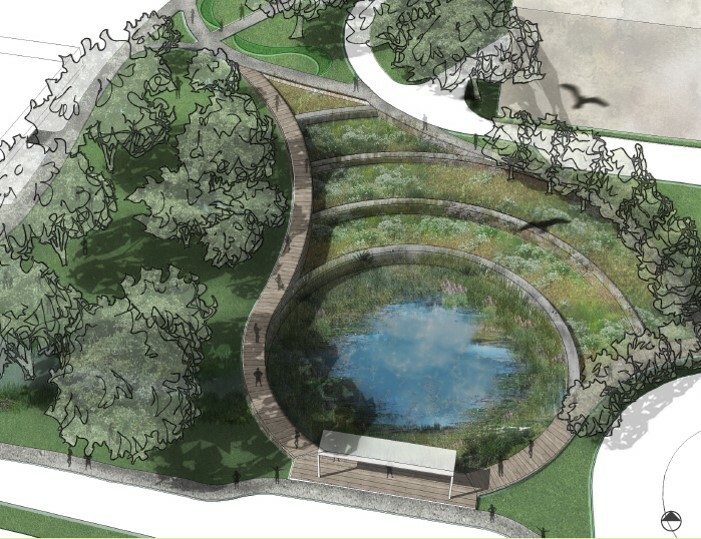 To create new spaces for interaction while demonstrating sustainable stormwater controls, the team proposed the addition of several campus amenities interwoven with green infrastructure. Among the proposed green infrastructure features are an outdoor amphitheater surrounded by rain gardens, a rain garden system in the shape of a Spartan shield, and a stormwater cistern with glass viewing pyramids. The team’s plan would reduce runoff from the 10-year, 24-hour storm by 30% and would restore soils and native plant communities. 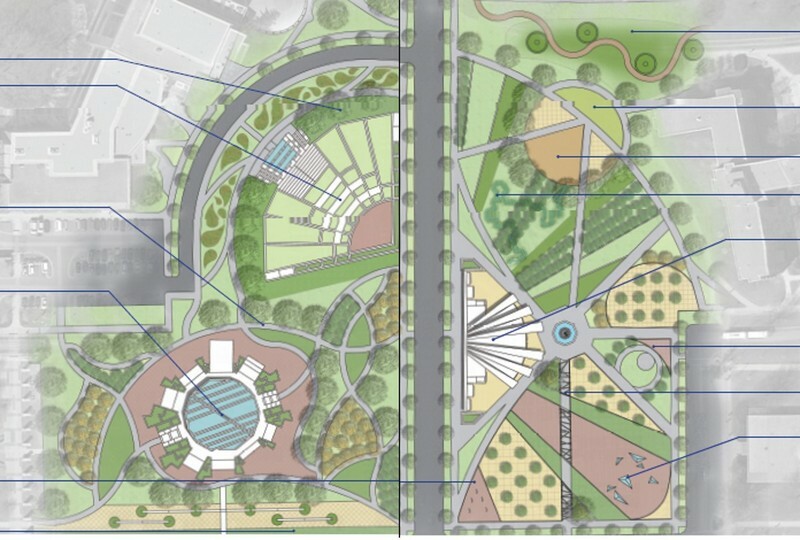 The team’s design plan centers on the half-hectare (1.3 ac) Union Green in the heart of campus. To create a multi-functional space that provides an educational experience, the team proposed a three-phase design. The first phase adds a 3785 L (1000 gal) above-ground cistern, an aqueduct, and bioretention to the west side of the site. The elevated aqueduct would provide visual water conveyance and irrigation, and educate passersby about stormwater management. The design would manage the 95th percentile storm and reduce peak flows for the 2-year, 24-hour storm below the pre-development condition. Honorable mentions were awarded to teams from University of Texas at Austin and Purdue University in the Master Plan Category, and in the Site Design Category, Kansas State University and University of Maryland were also recognized. EPA plans to conduct the third annual Campus RainWorks Challenge in the fall of 2014. Read more about this year’s winners and the competition.